We returned from our Western Caribbean cruise on the Allure of the Seas last Sunday but when we first left town we went down to Ft. Lauderdale a day early and spent the night there. 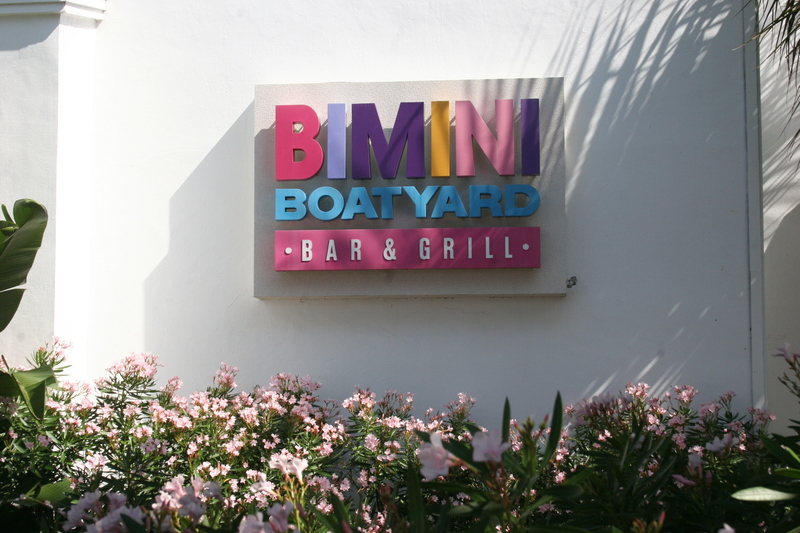 We had dinner at Bimini Boatyard which was within walking distance of our hotel and located right on the inland waterway. The temps were in the mid-eighties, there was a nice breeze on the back deck and the duo singing songs to the dinner crowd made it a perfect setting. Wine just didn’t seem like the proper drink for these surroundings and we all decided to go with some tropical drinks which the Bimini Boatyard was promoting. 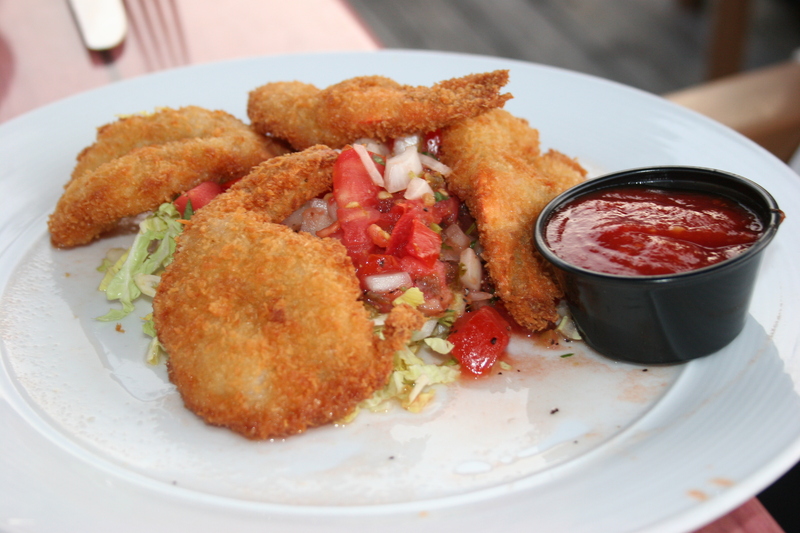 These turned out to be an excellent choice to accompany our meal. The menu was pretty extensive so we took our time, sipped our drinks, listened to the sweet sounds emanating from the stage and carefully made our dinner choices. We started with some Coconut Shrimp with a tangy Caribbean dipping sauce and although none of us declared this particular appetizer to be the best coconut shrimp we had ever tasted, it was still a nice way to start off the meal. Although I failed to get a picture we also had an order of their signature Bimini Bread which is kinda hard to describe. It’s sweet with an almost creamy icing swirled throughout the dough. It’s really pretty good although it’s certainly meant to be eaten alone and not with food. This was Joe’s choice and I thought it was the Yellowtail Snapper but now I am not certain. I do remember that he found it very dry and in need of more sauce and the photo seems to bear that out. 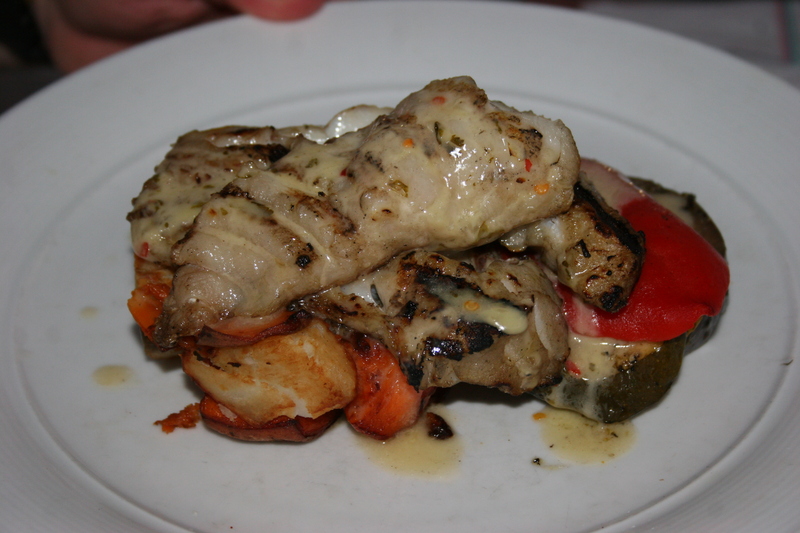 This was not a good-looking dish. 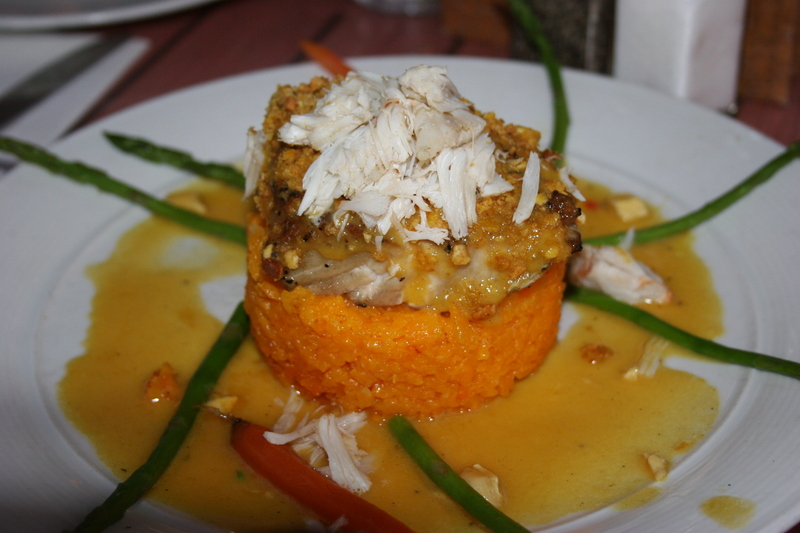 My Martinique Black Grouper was a considerably more attractive looking dish with a mango coulis glaze, topped with succulent crab meat and served in a passionfruit and brie beurre blanc sauce. It sounds terrific but for some reason the taste didn’t quite measure up. There was way too much of that orange stuff that the fish is sitting atop. It wasn’t bad, it just didn’t deliver the flavors I was hoping for when I saw it. Kathy and Carol both went right for the Barbecued Baby Back Ribs. I think they both expected about half of what they received as they seemed lost at the vast quantity of meat with which they were presented. 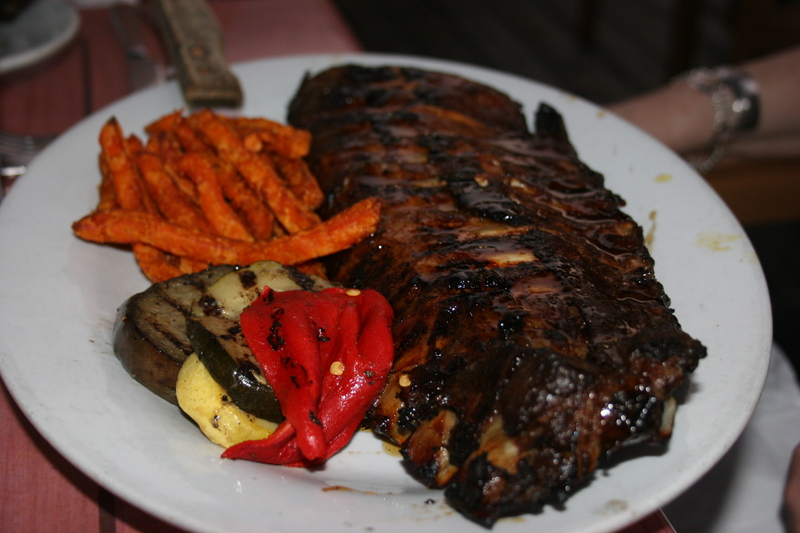 The ribs had a Jack Daniels glaze and were served with sweet potato fries. Both felt they needed more sauce on the ribs and our server brought more to the table but the glaze seemed watered down and did not provide the smoky flavor they were looking for. They did like the fries despite both leaving large amounts of the ribs remaining on their plates. We ended our meal by sharing a slice of Mango Cheesecake. This was a really nice dessert and a great way to end the meal. 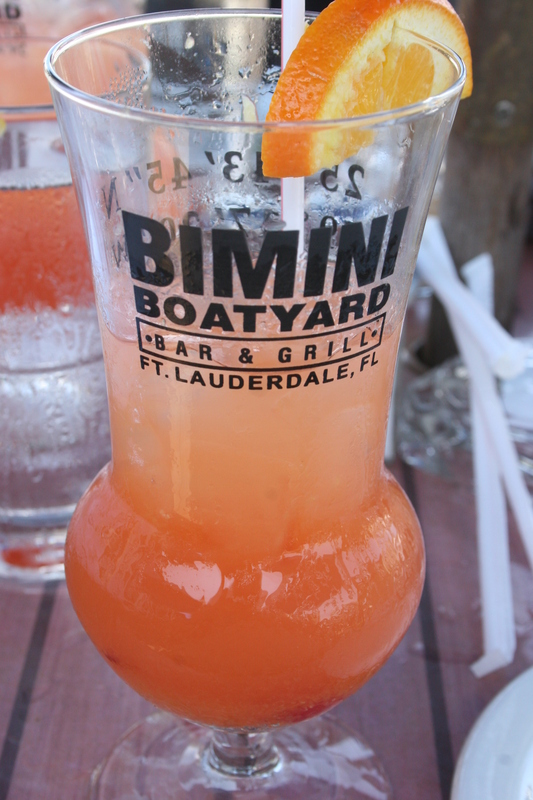 I had thought that Bimini Boatyard might be a chain but it is not. This waterfront site in Ft. Lauderdale is their only location. As I mentioned before, the menu is extensive and lots of items sound good. We might just have caught them on an off night. The setting alone makes this place worth a try if you are in the area.